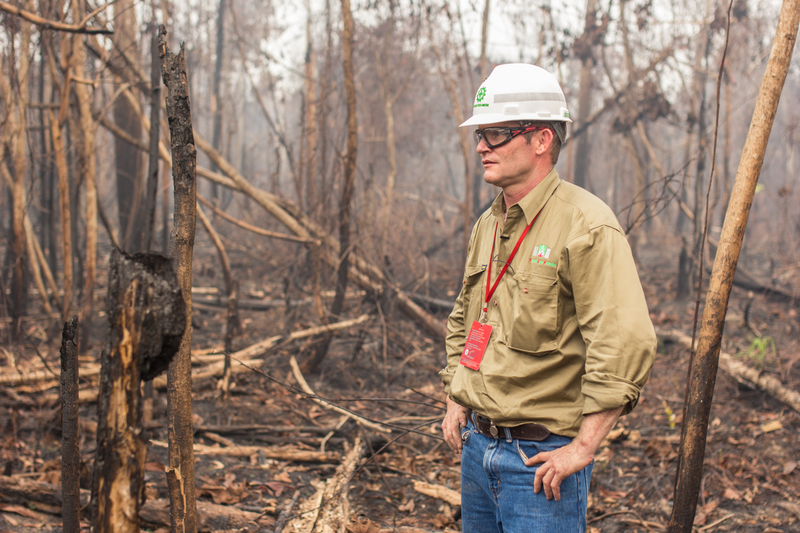 (3 October) I headed for Tesso Nilo National Park to assess the impact of wildfire on the park. I had read a lot about the incursion of fire into this largely unmanaged native landscape. As I understood it, the forest was being burned mainly for agriculture. The day was extremely hazy with PM10 readings exceeding 1,000 in Tesso Nilo. After a short drive we found a 250-hectare burned patch of native forest, an area that was clearly unmanaged. 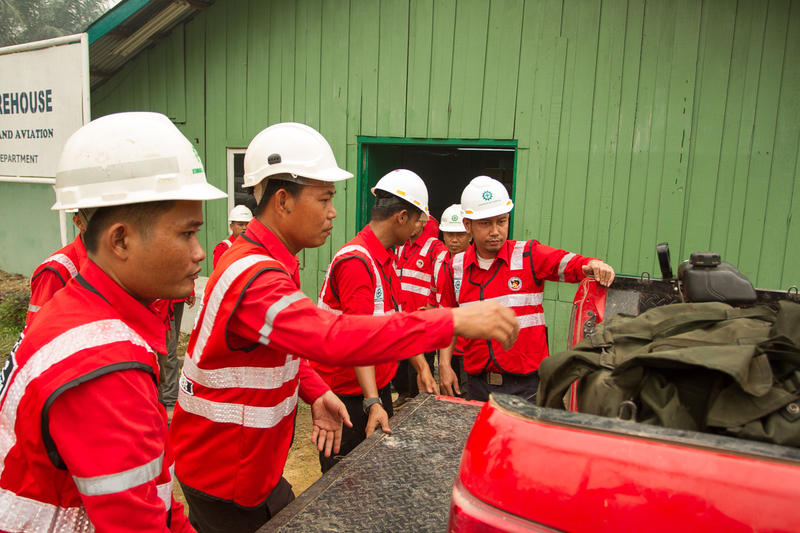 I was accompanied by Mr. Hendri, the local firefighting crew leader from the nearby APRIL estate. He explained to me that the APRIL firefighting resources were the only respondents to suppress this fire despite it being many kilometres from the APRIL estate. Land clearing by illegal means (wildfire) in the Tesso Nilo forest is a common occurrence and is slowly but surely eating away this valuable natural resource. It was very sad to see this forest burned. Following the visit to the burn site in Tesso Nilo, I then entered the APRIL plantation estate. What was immediately apparent to me was the highly maintained access roads throughout the plantation. Plantation segments within the concession were also small and divided by roads. From a fire fighting perspective, access to any concession fire would have been simple. It also meant that if a fire was to take hold, only a small amount of loss would be incurred. This type of forestry access is equivalent to any commercial plantation in Australia or the US, and certainly exceeds any other mineral land plantation access in Sumatra that I have seen. While inspecting the plantation, I learned about the daily patrols of the APRIL fire teams across the estate. Mr. Hendry explained that APRIL fire teams physically drive the estate twice daily, stopping particularly at high points to look at the landscape. This ensures that any ignitions, both off and on concession, would be easily detected. Finally, I visited a local village to speak with the village appointed fire coordinator which I found to be interesting. The support and equipment to empower the village residents to understand the risk and then respond to fire were all supplied by APRIL. Though it’s a small step to encourage social acceptance that fire in this landscape is hugely destructive, it is a great initiative. Despite the excessive haze, the APRIL team I was with were still unable to get me to an active fire on APRIL concession. This was impressive given the devastation I had viewed on other companies’ concessions earlier in the year.